LTHForum.com - The Spice House, which earns its praise every day. 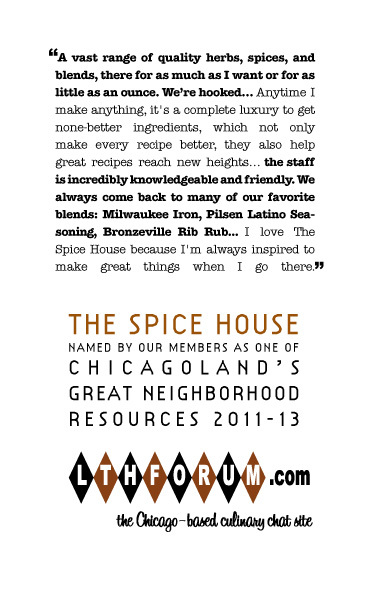 LTH Home > Chat > Great Neighborhood Restaurants > The Spice House, which earns its praise every day. Long ago, I learned the judicious use of herbs, spices and salts greatly improved taste. Lending a uniqueness to your food, which cannot be duplicated. Over the years, I have noticed the spice selection at the grocery store shrinking. Spice blends in greater abundance and variety than herbs and spices. My very first purchase of juniper berries was from McCormick's at the grocery story in th 1970's. You cannot find it on grocery store shelves anymore. I did a survey of eight grocery stores last year, only Treasure Island had some. I met some McCormick representatitives at a grocery convention. I commented their less than full spectrum offerings drove me to start using spice shops. Loosing me as a customer didn't cause them to bat an eye. Happily this customer goes to The Spice House, where juniper berries is one of many offerings. If I want something exotic like 'Grains of Paradise' from West Africa, it is there for as much as I want or for as little as an ounce. I may even pay less for the ounce of Grains of Paradise than I would pay for Juniper Berries in the grocery store, if I could find it. Sure, I have friendly connection with Patty Erd via Culinary Historians and Greater Midwest Foodways Alliance. Sure, Gary's BBQ "Soon to be Famous" Spice Rub is there. Neither of these circumstances influence this nomination. If I never met the owners, I remain impressed by the vast range and quality of their herbs, spices and blends. While I normally don't buy blends, there are some Spice House blends my family enjoys. The root of this addiction was related to winning a selection of their Chicago blends at an event. We're hooked! MincyBits wrote: My first instinct was that Spice House most likely has it, but I can't seem to find it on their website. That doesn't mean they don't have it - my search-fu could be weak. I reccomend stopping in and looking anyway, if only because you'll definitely find something there you will want. Cynthia wrote: The center of the spice universe is The Spice House. Owners Tom and Patty Erd offer the best spices around (Julia Child used to buy from them, and Alton Brown came to them when he needed to talk spices for his fruitcake show). gleam wrote: So, Beth is addicted to The Spice House's crystallized ginger slices. I admit, i love 'em too. They're crunchy and sweet and gingery and a little chewy. The effect it has on motion sickness is nice, too. G Wiv wrote: As an aside, I've found a 50/50 mix of Spice House Vulcan Fire Salt and granulated maple sugar are one of the better popcorn toppings I've tried over the years. ktb77 wrote: Try the jerk seasoning - if you follow the recommendation on the jar for the "authentic marinade" (you add a citrus, soy, and olive oil I think to the dry spice) it makes fantastic jerk. My husband now calls the Spice House "The Jerk Store" out of pure respect for this spice mix. crrush wrote: Spice House has the best file around. One day I asked if they carried it, and the woman, without missing a beat, said 'Actually, I think we've got a fresh batch coming out right now.' She disappeared for a minute and came back with a jar of it. Fantastic stuff. Cynthia wrote: Oh -- and let's not forget The Spice House in Evanston. Not food, but definitely a go-to place for people serious about cooking. Christopher Gordon wrote: Spice House is THE little, hidden gem. You'll be hardpressed(outside of traveling to divers ethnic stores) to find as complete a selection. paulette wrote: We lived walking distance from Spice House on Wells, and I bought my spices there in one ounce packages and really cheap prices. Having moved from there this past winter I tried Penzy's in Oak Park when going to my son's. They only sell spices in jars and I found their amounts and prices higher then Spice House. I really miss being close to spice house as I just bought a small jar of Tumeric at Domincts for almost $4 and I know I only spent around a dollar for it at Spice House. Christopher Gordon wrote: I've been enjoying The Spice House sichuan peppercorns for awhile now. They're much fresher than others I've found elsewhere. I nominate The Spice House, all locations, as Great Neighborhood Resources. This is a Great nomination. The Spice House is among the three best sources of spices in USA* and it happens to be located right in our own Neighborhood. What a Resource! I happily second this nomination. Patty Penzey Erd bought the business from her parents. Her brother opened his own operation name simply, Penzey's. Yes, I agree we are very fortunate to have these great resources in our neighborhood. Allow me to third this nomination, The Spice House is everything a GNR(esource) should be and then some! A great nomination and one which I completely support. The Spice House is a place that I have almost come to take for granted but in reality, we are SO lucky to have it. Anytime I make anything, it's a complete luxury to be able to go somewhere so nearby to get 'none better' ingredients, which not only make every recipe better, they also help great recipes reach new heights. But beyond the spansive and nearly-comprehensive roster of great items (which includes a lot more than spices), they also have a really knowledgeble, friendly and supportive staff. Tom and Patty are extremely wise in the ways of the spice, but so too is everyone else who works at The Spice House. That depth of knowledge -- and passion -- is so valuable when conceiving recipes, as well as executing them. This shop -- at least the one in Evanston, where I shop frequently -- is the ultimate trump card of (herbs and) spices. When you shop The Spice House, you NEVER have to worry that you could have bought better spices somewhere else. You can confidently proceed, with the knowledge that you simply could not have done better. I can't think of a higher compliment. Thinking back, I realize that I've recommended The Spice House to friends more than any restaurant. I could've spent days in the store the first time I was there. Such a fantastic resource. I fully support this nomination. When I read recipes in (for example) Fine Cooking, they'll occasionally call for less-than-common spices, and they'll offer internet sites to get them. I always know I can get them, usually more cheaply when shipping's considered, at The Spice House. A go-to place which really meets the "would you take an out-of-towner" criterion. Not that "would you take an out-of-towner" is the be all and end all of GNR criteria, but my mother always, always, insists that we go to the Spice House when she is in town. She always stocks up on spices and the like to take back to Louisiana (including Louisiana-centric spices, like cayenne and file). When you combine the selection (which turns over rapidly -- no dusty 5 year-old bottles of McCormick spices like you find at Jewel and Dominick's) and quality with the reasonable prices and the always helpful staff, this is an easy GNR from my perspective. Cathy, I am so pleased you made this nomination. I had been eyeing the approaching deadline and was wondering when The Spice House's name would be called. (I would have nominated it before the closing date but I didn't want my inarticulate writing to not do the nomination justice.) I put their Vulcan's Fire Salt blend on everything from watermelon to jicama to french fries and more. It is a great resource and should rightfully become a Great Neighborhood Resource. A textbook Great Neighborhood Resource, in my opinion. tapler wrote: Cathy, I am so pleased you made this nomination. I had been eyeing the approaching deadline and was wondering when The Spice House's name would be called. (I would have nominated it before the closing date but I didn't want my inarticulate writing to not do the nomination justice.) I put their Vulcan's Fire Salt blend on everything from watermelon to jicama to french fries and more. It is a great resource and should rightfully become a Great Neighborhood Resource. I'm glad you are pleased. Passion and enthusiam always comes across and not dimmed by writing skills. If you had done the deed yourself, I would have had to tap dance real fast to put something else together. For this alone, I thank you! Of course, you ran the risk nobody would do it. When in doubt, do it anyway ... lesson learned for next year! I love The Spice House and support this nomination. I love four things about the Spice House: first, they have the best selection and (as far as I can tell) best quality spices and related products around. Second, the staff is incredibly knowledgeable and friendly. I'm always given clear explanation when I ask about ingredients, ideas about to use something, etc. Third, they had an amazingly array of spice mixes and rubs. My wife and I have been trying to wean ourselves off of these and make our own from individual components, but we always come back to many of our favorites: Milwaukee Avenue rub, Milwaukee Iron, Pilsen Latino Seasoning, Bronzeville Rib Rub...Most importantly, I love The Spice House because I'm always inspired to make great things when I go there. My wife and I bought mini-jars of some of our favorite Spice House rubs to give as wedding favors, complete with personalized labels that described each one and why we loved it. The Spice House was great to do this for us and we received so many complements on the spices from our family and friends. This is a brilliant nomination, and is the essence of the new category of Great Neighborhood Resource. Since we can't grow our own nutmeg or cardamon (can we? ), TSH is essential. The Spice House is a place I walk into with one particular herb or spice on my mind, but can't walk out of without a bag full of cool ingredients I didn't know I needed until I saw them. Before I left Chicago, I made two or three special trips to the Spice House to stock up on items that, yeah, sure, other stores might carry, but for the quality, price and satisfaction I get from buying here, it's the only place I want to buy from. And the staff at the Spice House are a perfect, motley collection of incredibly friendly, helpful and knowledgeable people--rare birds in retail clerk-dom. I can't count the number of unusual and interesting ingredients I've learned about and purchased from Spice House. Definitely a GNR(esource)! For me, it's the Butchers Rub garlic pepper blend. I have used more of this than any other spice save perhaps their exqusite Tellicherry peppers. The chili powders I got there contributed to my one and only cooking award (Yay Vegan "chili"!) and for that I thank them. A couple days ago I opened my spice cabinet and reached in to grab something. I inhaled and thought to myself " It smells like the Spice House in here". I love that smell! For us, the Jamaican Jerk Seasoning (using the marinade recipe handily included on the jar's label as a guideline) is a staple for grilling, the Hot Curry Powder is almost always added to mac & cheese, and I love sprinkling a generous helping of the Taco Nacho Salad Blend onto my eggs as they're cooking. Plus I blame The Spice House for getting me hooked on fleur de sel, crystallized ginger (putting dishes of it by the register is pretty nefarious ), Tellicherry black pepper, and cinnamon so potent that taking a whiff of its storage tin makes you start sneezing. We once took a big bag of the jerk chicken to grill at a friend's place...they loved it, and asked about the marinade, so of course we filled them in. The next time they had people over to grill, the menu read like a Spice House catalog..."We've got pork chops with a Cajun Seasoning rub, Milwaukee Avenue Spice in the burgers, ribs with the Bronzeville Rib Rub...." They might just be more hooked than we are! Aside from all of the excellent points made above, one of my favorite things about the Spice House (and one that sets it apart from Penzey's) is that they are willing to sell tiny 1oz portions of most of their spices. This allows me to spend a little less, get a lot of things when I shop there, and not have to worry as much about my spices getting stale. An enthusiastic "Yea!" from me for the Spice House. One of the few GNR Nominations that could earn it's place by olfactory presence alone. Mhays wrote: One of the few GNR Nominations that could earn it's place by olfactory presence alone. And the only place that could be called both a GNR and an empire. A few weeks ago I parked a half block from Spice House Evanston, as I stepped out of my car the intense multi layered aroma hit me, carried me aloft like a cartoon character three feet above the ground into the wonderland known as The Spice House. I fully support the nomination of The Spice House for LTHForum GNR. One glance at my pantry would make it clear that I would have to support this nomination. At any one time, I'll have at least a dozen of their bottles on the shelf, plus a few packets in the fridge, and a couple of "empties" near the door waiting for my next visit. I love the individual spices, and rely on them for "real" cooking, but also rely often on the delightful blends. Sunny Paris blend (key ingredients include shallots and tarragon) is great on one's morning eggs. The Back of the Yards steak rub is incredible. I love the Adobo on burgers and the Rocky Mountain Blend on salads. The za'atar is great with olive oil on bread. So many great choices. Then there's the white truffle salt. Plus all the individual spices. So that's a big "yes" from me. Best food offering in the Old Town neighborhood, which also happens to be my neighborhood. Not much to add, but as an occassional baker, real lemon and vanilla extract are fantastic. We always buy peppercorns & red pepper flakes there as well. I even have cheese popcorn flavoring and buttermilik ranch dressing seasoning from there. Candied ginger & freeze-dried corn. Man, if these folks ever decided to sell food on which their seasonings were offered the line would run from the front door to the loop. Great Nomination and one I wholeheartedly endorse. I love the Spice House, and I love this nomination! The Spice House is an irreplaceable asset to my cooking repertoire. The selection, prices and service are top notch. Heartily endorse renewal of Spice House's GNR. I agree. The spice house is always included in the main places we shop for groceries or food related things! Great selection of spices and great service. Love the Spice House and greatly endorse it! a million times more knowledge since there is no one to even help you at the grocery, and even if there was, they wouldn't know a thing!